How often should you replace hearing aid batteries? How often you replace your hearing aid batteries will depend on a number of things like how long you use your hearing aids each day, the type of hearing aids you have, and the type of batteries you use. Have a look at the table below to get an idea of the typical lifespan of hearing aid batteries, as well as some handy tips about how to preserve battery life. When you buy your hearing aids at Specsavers, you’ll get four years’ worth of hearing aid batteries included, as well as other great benefits as part of our hearing aid package. Batteries are standardised within the industry and will fit most hearing aids. So you don’t need to worry about having the same brand as your hearing aids, or that you didn’t get your hearing aids with us – you can still buy your batteries from our online store. Choosing battery sizes can get confusing, as certain manufacturers will have different names for their products. But as each manufacturer is required to follow the colour-coded system, you’ll always know which is the right size for you, no matter what brand you choose. The four main sizes of hearing aid batteries are identifiable by the colour of their tabs – yellow, brown, orange and blue. So when you’re buying batteries for your hearing aid, all you need to look out for is your colour. 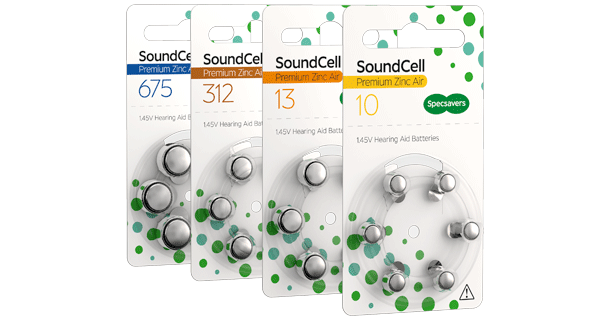 Hearing aid batteries can be recycled – so when you’re finished with them, the best thing to do is to drop them off at a battery collection point. You’ll find them at most supermarkets and shopping centres, or you can search online for the closet collection point to you. It’s important that you don’t put them in general waste as they will end up in landfill which can have damaging effects to the environment.